The Precision Flow 190PDE is a portable hand held Dual Mode clamp-on ultrasonic flowmeter with integrated heat calculator. The Precision Flow 190PDE can operate in both Doppler and Transit time modes, this allows the flow measurement of both dirty and clean fluids. The portable flowmeter also includes a choice of analog outputs, graphical display of data, data logger, RS232, USB, on board help, automatic speed of sound measurement and flow profile correction algorithm. The 190PDE portable heat and flow meter measures the flow rate, flow pipe and return pipe temperatures. It then calculates and displays energy rate and total as well as flow and return temperatures. 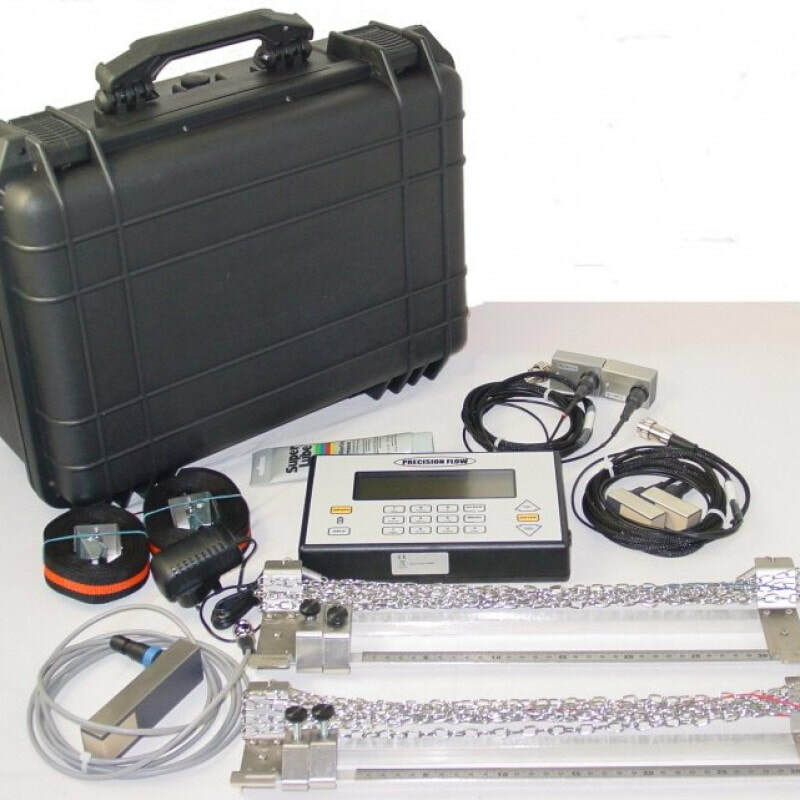 The built in logger can log flow rates, flow totals, energy rates and energy totals in most common units. The unit contains the specific heat capacity and density data for common fluids including glycol and water. Mounting hardware is included that allow the supplied temperature probes to be either surface mounted or used in pockets. This makes the Precision Flow 190PDE a truly flexible portable energy monitoring heat meter. Measure heat and liquid flow rate and total within a pipe without cutting the pipe. The Precision Flow 190PDE is a portable hand held Dual Mode clamp-on ultrasonic flowmeter with integrated heat calculator.